Steve Samuelian - California Consulting, INC.
Steve Samuelian, CEO, California Consulting, has held various leadership posts during a career spanning over 34 years. Steve was born and raised in the L.A. area and began his political and civic involvement in Los Angeles in 1982. In January 1995, Steve was appointed as Field Director for Congressional District 19. He was later promoted to District Director overseeing the 19th Congressional District Office staff and District operations for the Congressman, where he served in this capacity for 8 years. In 2002, Steve was elected to the California State Assembly representing the 29th Assembly District. He was appointed to the Assembly Appropriations Committee by the Speaker and served as the Vice-Chairman of the Assembly Elections and Redistricting Committee. Currently, Steve is the Co-Chair of the USC Unruh Institute Ambassador Program http://dornsife.usc.edu/unruh/ambassador-press-release/ and is elected to the Board of Directors of the L.A. County Business Federation (BizFed) where he is an elected Executive Committee Member serving as an Officer for one of the largest business organizations in the U.S.
A tireless worker for Armenian-American issues nationwide, Steve has traveled twice to Armenia. He traveled as an international election observer as part of the Office Organization of Security and Cooperation in Europe (OSCE) delegation to observe the adoption of Armenia’s first Constitution and later as part of a U.S. Congressional Delegation. He received the Armenian National Committee (ANC) Western U.S. Award for Outstanding Leadership. Steve has served on the Board of Directors of a Chamber of Commerce, a County United Way, and a Crime Stoppers organization. He has also been quoted in national, state, and local print and electronic media outlets regarding a variety of public policy issues. 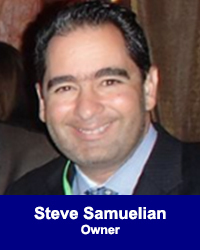 Steve Samuelian founded California Consulting in 2004. California Consulting quickly established a reputation for hard work and a commitment to success for its clients. California Consulting is the state’s largest grant writing company. Steve is happily married with two children and resides in Southern California.